Hockey Hero is an online casino game designed by Push Gaming. It features a variety of hockey-related items across five reels and which has a fairly high-payout if you master the art of matching up bonus icons and can create a great stack of multiplier increases. It isn’t a complex game and can be played by just about anybody who understands how to use a mouse and can click. For those who want to bet real money, it requires depositing real-cash deposits in a personal account associated with the site. However, you can play it for absolutely free as long as you don’t mind not winning any real money. 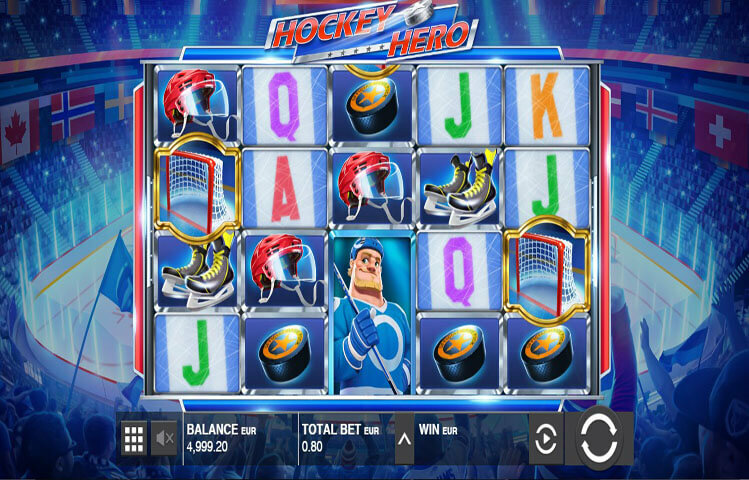 Hockey Hero is an online slot machine that has a 40-line payoff. This means it includes 40 different potential lines which can be used to win. It is centered around the sport of hockey and includes a variety of simple visuals that illustrates this. For example, the spinners show hockey players tumbling around as you play, setting the mood properly. The background images are similar in that they illustrate a hockey theme. For example, there are pucks and a variety of other items presented. The design is fairly simple and easy on the eyes, particularly visually. The theme is well-explored with a hockey arena in the background making you feel immersed in the game. As you spin the tumblers, you can win by matching various letters and pictures, including skates, hockey gloves, masks, and even the wild “championship cup,” which looks a lot like the Stanley Cup. There’s not a real heavy emphasis on excessive visuals with this game, focused more on building on the simple theme. Bonuses in Hockey Hero are limited to a few bonus games and the respin feature. The latter feature comes into play when you get a full-reel icon in Reel 1. This allows you to lock certain images (including the Hockey Hero and Gold Trophy Wild icons). The respin will then take place and hold any more Wilds or images of similar players. These icons will then be held as the machine continues to spin. This chain of events could cause payouts as high as 250x your winning, making this a powerful way to make a lot of money on a spin. The Gold Trophy (the one that looks like the Stanley Cup) will automatically complete any grouping to help improve your payoff. However, if three or more Goals appear during the play, you will immediately play one of the random five mini games. These are simple extra spins that take place on bonus reels and use only a handful of the icons. These extra options can help you make extra money on each spin, particularly if you continue to land extra wilds on each spin. As a result, it’s fair to say that this game isn’t a visual stunner when compared to other games of its type. Not that online slot machines have to be visual powerhouses. In fact, most of the fun of these games is centered around ease of control and how well it presents a simple theme. With a few basic clicks on the mouse, this game is easy to control and you do feel like you are in a hockey arena, making it appropriate for the genre and the type of game.